If one wore Tzitzis without a blessing, such as it was worn in an area or at a time that a blessing may not be said, then when the opportunity arrives he is to shake the fringes of the Tallis and then say a blessing over it. After the blessing one is to look at the Tzitzis and kiss them. Prior to Davening: Whenever one wears the Tallis Katan prior to Davening, in an area that the blessing cannot be said, he is to delay the blessing of the Tallis Katan until directly prior to Davening and does not say it immediately upon the first opportunity arriving. Plans to wear another Tallis Katan: If immediately upon the opportunity arriving to say the blessing on this Tallis [Katan] one plans to wear another Tallis [Katan], then he does not need to shake the first Tallis and say a blessing, and is rather to simply say a blessing on the second Tallis, and have in mind to exempt the first Tallis that he is already wearing. If however one plans to wear another Tallis [Katan] only later on in the day, then one is to shake the Tzitzis and say a blessing on the first Tallis as soon as the opportunity arrives. Plans to wear a Tallis Gadol later on: If one wore a Tallis Katan in an area, or at a time, that he is unable to say the blessing, then if he plans to wear a Tallis Gadol later on that day, such as for Shacharis, then he is not to recite a blessing on the Tallis Katan even when the opportunity arrives, and is rather to say a blessing on the Tallis Gadol and have in mind to also fulfill the obligation of his Tallis Katan. When is the blessing to be said on the already worn Tallis Katan? The Poskim imply that the blessing is to be said immediately upon the opportunity arising. Thus if one wore the Tzitzis in the Mikveh, then as soon as he leaves the Mikveh he is to shake the Tzitzis and recite the blessing. However the Chabad custom is that if one wore the Tallis Katan before Shacharis in an area that he could not say the blessing, then he is to delay the blessing until prior to Davening. Nevertheless, if the Tzitzis are worn in an unclean area after Davening, then the blessing is to be recited upon the first opportunity, as implied from the above Poskim. If one wore the Tallis Gadol without a blessing, must he remove it and perform the Yishmaeli wrap in order to say the blessing of Lehisatef? Example: One’s Tallis fell off during Pesukei Dezimra and was replaced. 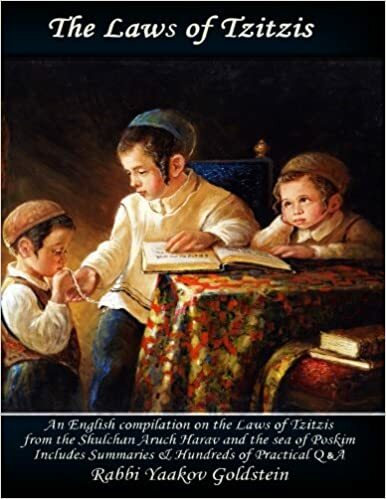 Is a blessing of Lehisatef to be recited after shaking the Tzitzis after Yishtabach? It is not necessary to remove the Tallis and perform the Yishmaeli wrap prior to saying the blessing of Lehisatef. He is rather to shake the fringes of the Tallis and then say the blessing of Lehisatef over it. Ruling of Admur in Siddur: In the Siddur [letter 26 Raskin] Admur rules that when wearing the Tallis Katan in the morning with unclean hands a blessing is never to be made later on if he will be wearing a Tallis Gadol. It is unclear if this ruling would apply if one plans to wear a second Tallis Katan later on in the day, and hence completely negates the ruling in Admur ibid. See Siddur Raskin ibid that seemingly the reason for Admur’s ruling in the Siddur is to avoid an unnecessary blessing of Al Mitzvas Tzitzis, and to avoid needing to say the blessing on the basis of shaking the Tzitzis. Vetzaruch Iyun. So writes Admur ibid “immediately upon his hands becoming pure”; so also writes M”B 8/24 and 30; These words are omitted from the Michaber ibid. Hayom Yom 14th Sivan; Vetzaruch Iyun as for the reason and source behind delaying the blessing until Davening. The reason: Seemingly the reason for this change of ruling regarding one who will wear a Tallis Gadol is because a) Not all opinions hold one may recite the blessing of Al Mitzvas Tzitzis. [See Halacha 3] b) Not all opinions hold one may say a blessing on an already worn Tallis through shaking its corners. Hence to suspect for these matters Admur rules in the Siddur that it is simply better to include the blessing within the blessing over the Tallis Gadol. Based on this, no proof can be brought from the Siddur or Hayom Yom regarding if one who wears a Tallis Katan in an area that the blessing may be said, that he should delay the blessing until he wears the Tallis Gadol, as perhaps this ruling is limited only to a case that one already put on the Tallis without a blessing, and on the contrary from Hayom Yom ibid it is implied that in such a case a blessing is to be said.